A hygrometer for the home is a simple, affordable way to monitor the relative humidity in your home. If you're wondering what relative humidity is and why you'd want to monitor it, we'll explain. We'll also tell you about our top recommended indoor hygrometer. What Does a Hygrometer for the Home Do? A hygrometer measures the relative humidity in your home, much like a thermometer measures the temperature. Relative humidity is a measurement of how much moisture is in the air. The warmer the air is, the more moisture it can hold. Relative humidity is expressed as a percentage, so if the air contains half the amount of moisture it could hold at the current temperature, the relative humidity is 50 percent. The math might sound complicated, but a hygrometer makes it easy to monitor the relative humidity in your home. Most hygrometers are easy to install. In fact, the word “installation” may be a bit misleading. Typically, all the installation that's needed is to put a couple batteries in and either set the unit on a tabletop or mount it on your wall. 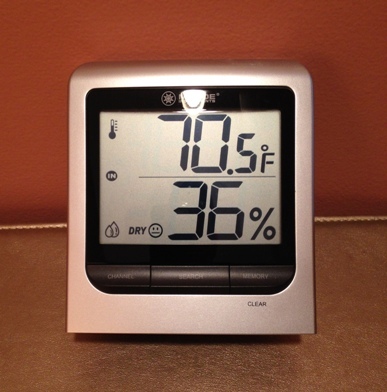 Most hygrometers display the relative humidity on an easy-to-read LCD screen. The U.S. Environmental Protection Agency (EPA) recommends keeping the relative humidity in your home below 60 percent to discourage mold growth. Most people feel most comfortable with the relative humidity between 30 and 50 percent. A hygrometer doesn't change or adjust the relative humidity in your home. It just gives you the information. That information allows you to decide whether or not to take steps to adjust the relative humidity yourself. Do You Need a Hygrometer for the Home? While you can live without a hygrometer, one can help you make your home more comfortable and prevent mold growth. It's similar to the way a thermometer helps you adjust the temperature in your home in order to keep things comfortable. If the relative humidity in your home is too high, your home may feel stuffy and uncomfortable. The risk of mold in the home will be greater, as well, and mold can cause all sorts of health problems (you can read about mold-related health problems) and damage your home and furnishings (you can read more about how mold damages your home). If, on the other hand, the relative humidity is too low, you may develop dry skin, chapped lips, or even a sore throat. Wood may warp, damaging furnishing and musical instruments. Just like you can adjust the temperature in your home, you can adjust the humidity, although it's not quite as simple as turning a knob on a thermostat. If the air in your home is too dry, as indicated by low relative humidity, you can purchase a humidifier. A humidifier is an appliance that puts more moisture into the air. If the relative humidity in your home is too high, you can purchase a dehumidifier, an appliance that removes moisture from the air. Installing a hygrometer for the home allows you to determine whether you need a humidifier or a dehumidifier and whether they are working as intended. So do you need a hygrometer in your home? Well, we think everyone can benefit from having one, and since they are easy to use, widely available, and very affordable, there's really no reason not to have one. Still, some people probably need one more than others. If you live in an area with warm temperatures and high humidity, like the southeastern United States, you're more likely to have high levels of relative humidity in your home. If you own valuable wooden antique furniture or musical instruments, you probably want to protect them from warping due to low relative humidity. If you're allergic to mold, or if you have asthma or other respiratory or immune system disorders, taking steps to prevent mold growth in your home will be especially important. Our favorite hygrometer is the AcuRite 613A1. It's the number one best selling hygrometer on Amazon, where customers rate it 4.3 out of five stars. It can be placed on a tabletop or mounted on a metal surface with its magnetic backing. The screen displays the indoor temperature as well as the relative humidity and the highs and lows from the last 24 hours. It is battery operated and has a low battery indicator light so you know when it's time to change the batteries. We like it because it's accurate, easy to use, and quite affordable. To learn more about our favorite hygrometer and to read reviews from customer that have one, just follow the link.